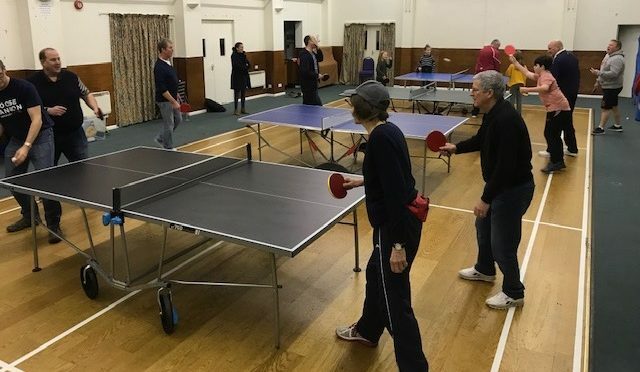 Thanks to everyone for such an enthusiastic response to the three Blewbury Table Tennis Club Taster Sessions! We had 25+ people at each session, which meant that our four borrowed tables were all in use right through each of the evenings. We had participants varying in age from 8 – 80+ and a really good mix of standards. We are aiming to cater for anyone however experienced or inexperienced. An added bonus at our January session was a visit from an ex British top 100 ranked table tennis player, Justin Mead, who gave us lots of encouragement, tips and coaching as well as a big box of top grade balls! Based on this response we are now going to go ahead with Tuesday evening sessions every week from 6-9pm in Blewbury Village Hall with the opportunity for people to drop in for whichever part of the evening suits them. Why not start the new year with a new Blewbury activity? You will be very welcome if you want to join us. Session fees: £5 Adults. £3 Under 18s.